Not wishing to rest on my laurels – suitably green though they may be – when it comes to my Night Goblin army, I’ve added a couple more recruits, a pair of fanatics whirling destructively into battle. These two were half finished at the end of October and rather than allow myself to get distracted and leave them incomplete for who knows how much longer I wanted to put brush to model and finish them off properly. Something I have been keen to avoid, especially after pouring so much effort into the army over the past few months, is allowing progress to stall entirely whilst I concentrate on other projects. Thus, whilst I was working on the fanatics I decided to press on and paint up this goblin shaman as well. With these latest additions the heap of unpainted greenskins continues to reduce in a pleasing manner but there is still plenty more to finish and, with signs of a forthcoming Moonclan/Night Goblin release from GW which may well lead to me relapsing into my old goblin-purchasing ways, I’ll keep chipping away at them for now. I planned to paint this very old spider-loving goblin shaman for Neglected Model Month but alas he was so neglected I didn’t even manage that. Never mind though at least he’s done now! Oh, and for anyone who thinks that an overabundance of skulls is a modern phenomenon amongst GW’s miniatures there are seven of them on this little dude. Indeed his love of both spiders and skulls puts him on a par with most goths I know (which needless to say is a very good thing indeed). It’s time for this week’s progress report on the night goblins (not including the Battle Standard Bearer who got his slice of the limelight earlier in the week). I’m planning to anchor the army around a horde of Night Goblin spearmen, backed up by a smaller unit with shortbows. Together these will represent the rank and file of the clan, who’ve been driven from their mushroomy lair by the call of the Waaarg! This week it’s been very much a collection of odds and ends as most of the models in these two squads are still halfway through being batch painted (something I would previously have shuddered to consider but I’m giving it my best shot nonetheless). However, in the interests of having something to show you, I cracked on with these three spear-gobbos to get them finished (which also results in a pleasing, albeit only small, reduction of the pile still to be done). I’ve also started work on the unit of archers with six of the little rascals ready for action. This chap used to be a spearman but somewhere along the road he got careless and broke off half of his spear. Enter a quick and thematic repair and he’s ready for action again. Night goblins are always looking to even the odds against stronger, braver opponents (that’s basically everyone). Chucking a net over them is hardly honourable but luckily goblins are sneaky gits and don’t get worried about things like that. And of course any night goblin army needs a few squigs around. Overall then progress has been fairly solid, although I could probably have used to break more ground on the spear-gobbos and archers if I’m going to make my target of finishing the unit by the end of the month. We’re roughly half-way through the month now though and, although there’s still plenty to do, I’m pleased with the progress so far. I’ve spoken before about the goblin army that’s been gathering on the edge of my desk, now it’s time to do something about it. In the past, when I was young and ignorant, I would decry people who ended up with heaps of unpainted models cluttering up their homes. “If you’re not going to paint it”, I would say snobbishly, “why are you buying it?”. The target of my ire wasn’t people who only want to game and find painting dull or a chore, fair play to them really. No, I heaped my disgust on people who like to paint but who lacked the self-control to not buy more than they can deal with – people like myself essentially, and probably most of my readers. Naturally, time has made a fool of me and my loudmouth assertions. Furthermore I claimed that I would never buy any fantasy greenskins because my heart was already sold to the orks of 40k. The goblins, little devils that they are, gathered anyway, a great horde massing in the corner of the room whilst I was busy denying it’s existence and burying my head in the sand. In the end, of course, you can’t keep ignoring it any more, but by that point it had grown so big and imposing I found myself a little frightened to tackle it. Some people call it the grey tide, others the lead mountain, in my case it’s actually a combination of the two, so the question is; what to do about it? Ignoring it has got me this far but that won’t make it magically paint itself. Plus, I want to paint it, it’s just that the thought of starting is quite overwhelming. The tricky part in a situation like this is breaking the inertia. Once an army is underway it’s easy enough to add a few more models as the whole project begins to develop its own momentum. I could try the technique of adding at least one model every month, as has proved so successful with my Skaven but as I’m still doing that with the rats trying to do the same thing at the same time with the gobbos feels like asking for trouble. How about option three then; taking a run at it. After all they’re only little, and relatively easy to paint. How hard could it be (he said with a note of hysteria in his voice). Plus Azazel has set this month as Neglected Model Month in his series of monthly challenges, and this isn’t just a neglected model it’s a whole neglected army. Then we have all the various goblins I’ve painted in dribs and drabs over the past few years, always during my brief spells of enthusiasm when I would claim that this time I really, really would get them done. None of them are perfect but for the moment I’m focusing on the fact that they’ll be hidden amongst a huge mob of their clanmates, and that if I go back to touch them up now I’ll never get anywhere. I’d also add that these are Night Goblins and not Moonclan Grots. Age of Sigmar is an exciting world in its own right and so was old Warhammer. Few things were as iconic of the old world as the Night Gobbos and although I appreciate why GW transferred them across, indeed I’m glad they did, they don’t feel as comfortable a fit in the new realms as the races which were born there, like the Idoneth, or those which are a bit more generic like the Ironjaws or the Undead. I don’t really have a defined goal with these, I certainly don’t expect to have everything done by the end of the month, or even by the end of the year. I would like to be able to say, by New Year-ish, “I have a little Night Goblin army” rather than “I have a load of unpainted models I’m faintly ashamed of”. Exactly how many I manage to deal with before the end of September however remains to be seen but I’ll count anything more than a handful as a victory and go from there. Aren’t You A Little Short To Be A Warboss? A quick heads up to anyone who’s interested, the third Greenskin Wars kickstarter is now underway. 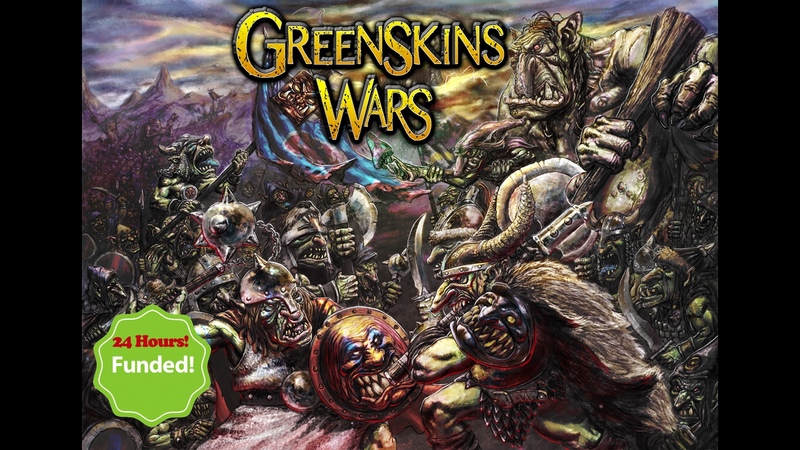 I don’t tend to promote, or even contribute to, many kickstarters, but I’m a huge fan of these goblins and I’ve had really good experiences with Greenskin Wars in the past – which means I’m rather overexcited about it all. I’ll admit however that I tend to find blog posts extolling the virtues of some kickstarter or other tend not to get more than a passing glance from me, so I intend to legitimise the whole thing and explain that the real reason I’m writing about this at all is that the new range of goblin models has me inspired to actually put paint on some of the ones I’ve already bought. For the moment I want to keep focussed on some other projects but at the very least I can indulge my urge to paint greenskins with this goblin hero. Most likely he’ll end up serving as a goblin boss when I finally get around to my long planned night goblin army (someone has to contest the Skaven dominance of the Underway after all). Just before I took off on my holidays I received a parcel. Normally I don’t do ‘unboxings’ and I try to avoid banging on about projects I know I won’t be able to start for a few months. This time however I’m going to break with that because time spent showcasing Greenskin Wars is, in my opinion, time well spent. For those of you unfamiliar with Greenskin Wars the range incorporates the old Crooked Claw models (good news for those like me who skipped blithely through life, unaware that Crooked Claw even existed until suddenly it didn’t) alongside a range of new models courtesy of “Goblin Master” Kev Adams* and spearheaded by Diego Serrate. *Apparently he thinks being called “Goblin Master” is a bit silly, but everyone does it anyway, Well if it bothers him he shouldn’t make such amazing looking goblins should he? Late last summer a kickstarter campaign was used to fund the range, sculpt the new models and so forth, although those who missed it should keep an eye on the Knightmare Miniatures store, soon to be home to the range, as well as various Chaotic creatures from the astonishing Pantheon of Chaos range and various Rogue Trader-esque Space Raiders. Those of you who’re on facepuke (and sadly, nowadays, who isn’t?) would also be well advised to join the Greenskin Wars group to keep up with the latest developments. I’ll confess, I’ve always loved the greenskins. They’re not, as such, an evil race like Chaos, the Undead or the Skaven – although undoubtedly it must feel like that when they’re burning down your village. Rather they’re mischievous, always up for some rough-housing or spectacularly destructive practical humour, squabbling amongst themselves, needing to be kicked into line and living by the maxim “to have a good time, all the time” even if that ends up being horribly violent for everyone else. As Warhammer races go they’ve undoubtedly evolved the furthest from fantasy’s roots. Tolkien would recognise the elves of Ulthuan but Sauron would have been lucky to get out of Mordor if his armies had been made up of the squabbling goblins we know and love today. (Digging back a little further of course a norseman wouldn’t have recognised either of them, but that’s a blog for another day). Likewise 40k may have pretensions of grandeur, as a great, decaying dystopia, but the Orks still go roaring through the middle of it on their motorbikes, scattering the serious-faced eldar and space marines, and making fart jokes in front of all the grandiose fall-of-empire sobriety. What’s more we let them get away with. No matter one’s attachment to the funereal grim darkness of the far future or the grubby madness of the Old World everyone cracks a smile at the arrival of a thuggish ork or a scheming goblin. Perhaps it’s because they’re all, at heart, naughty schoolboys, and most of us discovered them when we too were naughty schoolboys. In the greenskins we recognise ourselves as we would like to be; carefree and burning with the joy of life, not burdened by duty and responsibility like a Space Marine, not bravely facing the yawning grave like the Eldar, but racing through life laughing, never worrying about hardship or want and when we go, going out with a bang that leaves our mates’ ears ringing for a week. 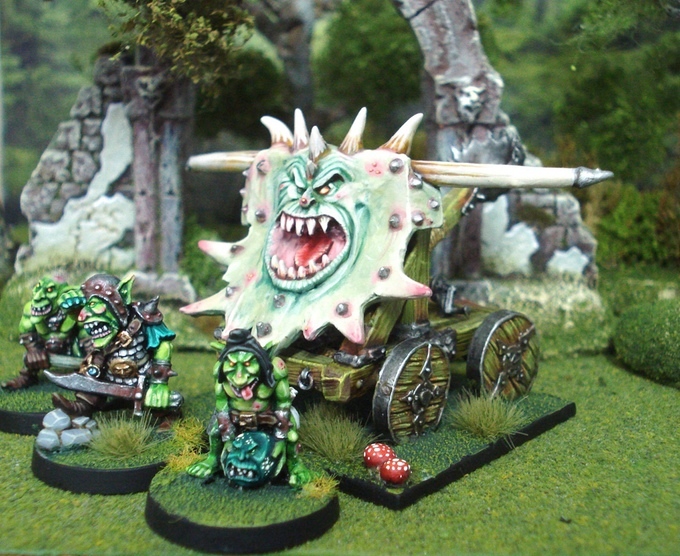 Until recently however I have pretended to myself that I am above such things as fantasy greenskins. My love of Orks in 40k means I’ve tended to focus all my greenskin tendencies in that direction. The orcs and goblins of the fantasy realms would only serve to dilute my creative energy, divide my ideas and distract me from those projects I should be focussing on. How foolish of me – didn’t I see that goblins thrive on distraction and that nothing possesses more energy and (generally destructive) creativity? In the meantime though let’s take a look at what actually arrived in that box of exciting metal figures! First of all we have this raucous band of feral goblins. Whilst his impish-looking mate isn’t much better, he’s wearing a bat! As goblins go some of them are quite large, although that’s understandable given the level of detail that’s been packed onto them. I also tend to assume that goblins, and orcs, are all different sizes anyway so it doesn’t particularly matter. Here’s the chief of the feral goblins posing with a GW night goblin and a WIP 40k ork by way of a size comparison. As well as the band of feral goblins I also got myself this catapult, originally sculpted for the Crooked Claw range. I’ve not assembled it yet so you’ll have to make do with this picture of the crew, plus a stock image of the catapult itself. As usual with kickstarters there were a few ‘bonus’ models to sweeten the deal for supporters, including this (decided non-greenskin) clothes-phobic Conan look-alike. On a more goblin-esque note we have this hobgoblin, who’ll probably be serving as taskmaster to the catapult crew. Again he’s a rather big lad, although as the taskmasters are usually orcs that’s actually quite fitting. The hobgoblin was included in the original kickstarter campaign as a stretch goal which, if achieved (and clearly it was!) would unlock a whole new hobgoblin faction and previews shown over on the facebook group show this to be well underway. However my favourite thing has to be these mushrooms. I’ve always liked the mushroom gardening aesthetic of the goblins, particularly the night goblins, and these giant ‘shrooms bring that to the collection with aplomb. That’s not all though, we also have these smaller mushrooms, perfect for planting amongst the ranks of the goblins. 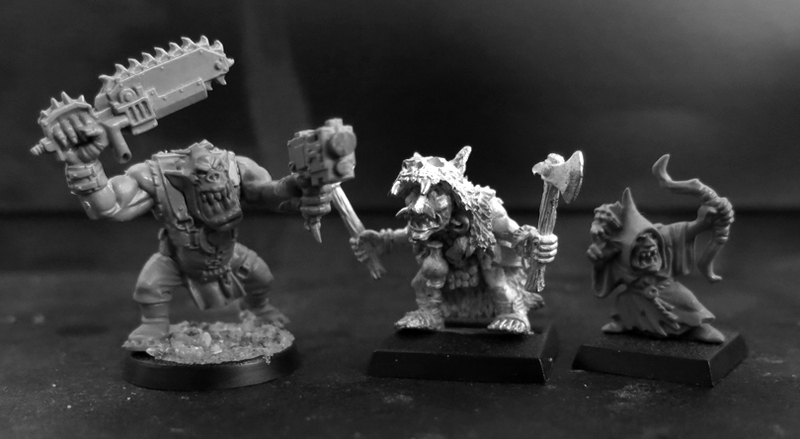 Now I know I said I wouldn’t be doing anything with these for a couple of months, and I won’t – but I couldn’t resist digging around in the bits box and assembling a couple of additional goblins to join the forthcoming mob. Just a quick mid-week update to show you my latest Orky experimentation. When the Ironjawz were first released for Age of Sigmar I was fairly certain that the heads of the hulking Brutes and Gore-gruntas would be a neat fit for Ork Nobs. As it turned out I was wrong – they’re much too small although they do look rather nice on Ork Boys instead. Would you just look at that happy face! Someone knows it’s Christmas! I’m planning to add a few more slugga-boys to the ranks (hence the rather optimistic use of the words ‘Part 1’ in the title – but that will have to wait until the new year now.